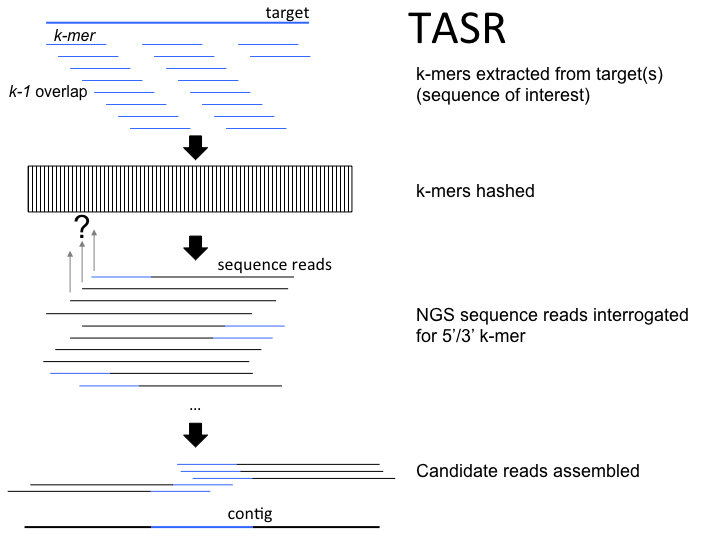 TASR is a genomics application that allows hypothesis-driven interrogation of genomic regions (sequence targets) of interest. It only considers NGS reads for assembly that have overlap potential to input sequence targets. It has enormous potential for interrogating comprehensively enormous data sets, such as those from The Cancer Genome Atlas (TCGA). For instance, with TASR, we profiled a novel lncRNA in over 7600 RNA-Seq bam files representing that many samples from 27 cancer types in less than 7 days (160 simultaneous process at a time in cluster sharing environment) on modest hardware (total computing power of 974 cores, 79 IBM X3550 M2 Intel Xeon E5430, Sun X2270 M2 Intel Xeon X5355 and Sun X2200 M2 AMD Opteron 2354 computers averaging 2.5 GHz and 16GB RAM each networked using Gigabit ethernet infrastructure). This is achieved in part to TASR's low memory requirements and speedy assembly execution (reading .bam file with samtools took ~7h in average while the assembly 0.5 seconds). TASR, which is a specialized de novo targeted assembler utility derived from our SSAKE assembler (http://www.bcgsc.ca/platform/bioinfo/software/ssake), is the engine behind HLAminer (http://www.bcgsc.ca/platform/bioinfo/software/hlaminer), the first published technology for obtaining HLA predictions directly from NGS shotgun datasets (WGS, RNA-Seq, Exon capture). TASR is implemented in PERL and runs on any platform where PERL is installed.